I woke in the woods. Bleary-eyed. In stillness and dark. Surrounded by evergreen trees and a modest snowfall. How I got there was, for the moment, a mystery. I exhaled and everything went hazy. I pulled my head back to reveal a large picture window inches from my face. And a shrinking spot of condensation on the cold glass where the mark from my breath quickly faded. Oh, right: New Hampshire. A cabin in the woods. Such was the theme of our getaway at Getaway House. Our weekend here started with a mystery: we knew only that we were going to New Hampshire. Somewhere in New Hampshire with the promise of escape from Instagram and Spotify and Facebook and the 24-hour cable news cycle. Book here and get $25 off your Getaway stay! A stay Getaway House is no ordinary hotel experience. There’s no lobby, no reception, no bellhop waiting to usher your luggage away on a brass luggage cart. The check-in process at Getaway is as simple as the cabins themselves. On the morning of our arrival day, we received a text and an email with all the necessary details to find our cabin. 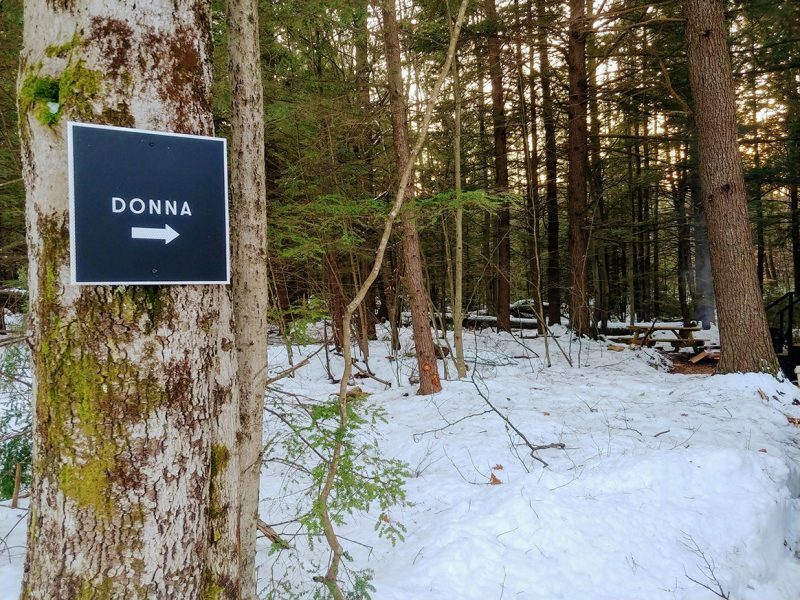 After a two-and-a-half-hour drive from Vagabondish HQ in southeastern Massachusetts, we arrived at our jet-black Getaway cabin (nicknamed “Donna”) in the wilds of New Hampshire. I won’t say exactly where as that discovery is part of the fun. We punched in our check-in code on the cabin’s automated door lock and we were in. Inside, the design is crisp, minimal, and neat as a pin. There’s a distinct sense of having everything you need and nothing you don’t. The open-concept layout is three-tiered. We entered into a small kitchen area that flows into a stepped, mixed-use space with chairs and bench seats for dining and relaxing. 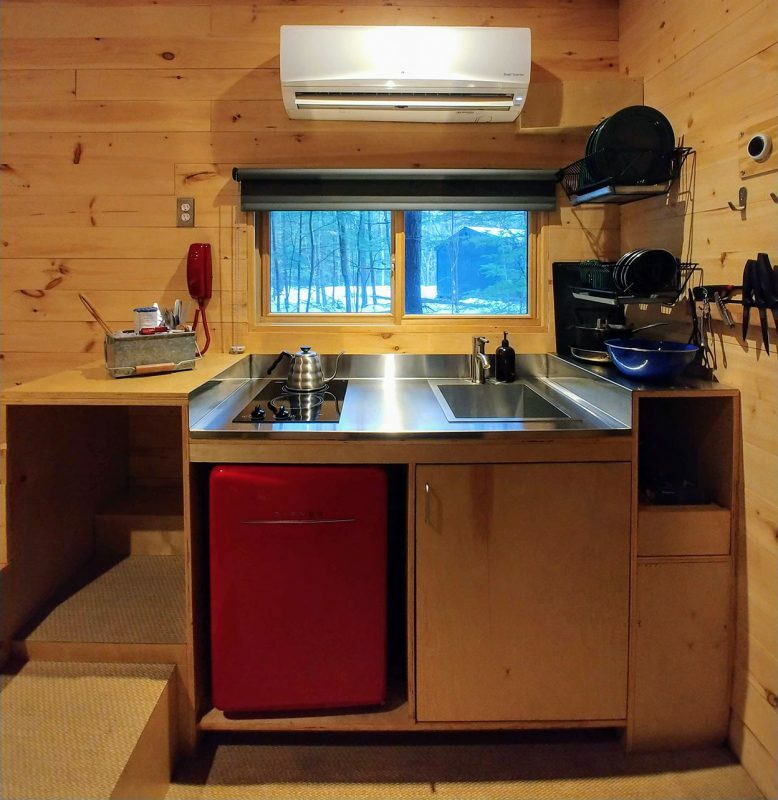 The kitchen offers everything you’d expect in a tiny house or a modest RV. There’s an electric cooktop, mini-fridge, and a sink with hot water, plus essentials like dishes, utensils, and cookware. Free s’mores are provided to get the party started! While most guests will want to bring their own food, basic cooking necessities like salt, pepper, and olive oil are provided. There’s even an a la carte “minibar-style” provisions drawer with snacks, oatmeal, bug spray, and the like for sale. Nothing costs more than $10. 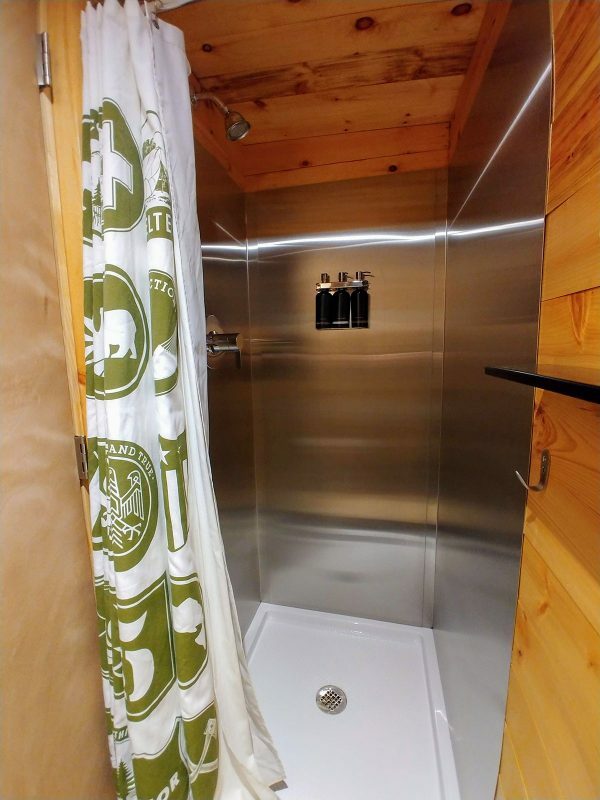 Adjacent the kitchen is a tiny bathroom with a stainless-steel-wrapped shower stall and just enough floor space to do your business. A “spa bathroom” this is not, but we weren’t expecting that anyway. The toilet uses some sort of newfangled, aluminum-foil-powered, space-age technology that must have been invented by NASA. We still don’t totally understand the wizardry behind it! Somehow it just worked. Outside, we found a cozy campfire area with a fire pit, Adirondack chairs, and a picnic table. Free s’mores are provided to get the party started, and additional provisions like firewood and firestarter logs are for sale in a bin outside. A squirrel at the window. Every aspect of Getaway House Boston is designed for quiet, tranquility, and escape. 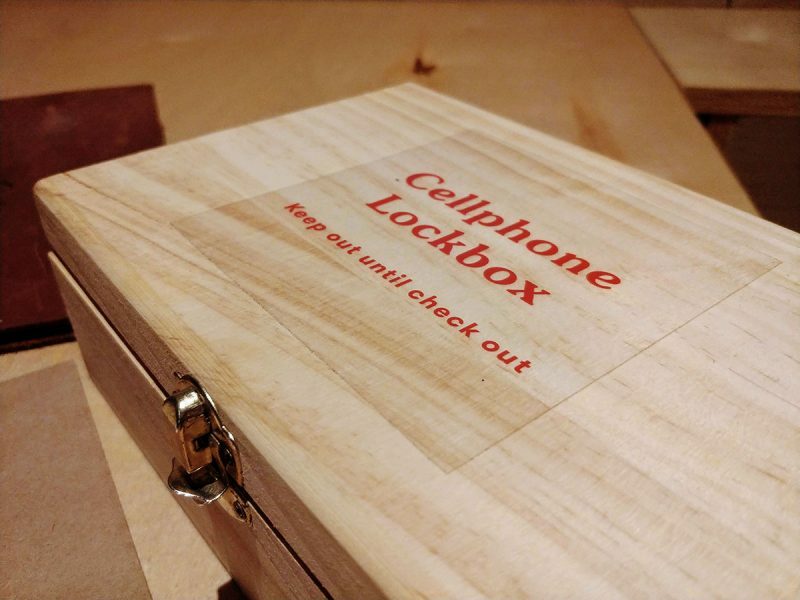 Upon arrival, we took advantage of the wooden cellphone lockbox provided to disarm us of our devices. 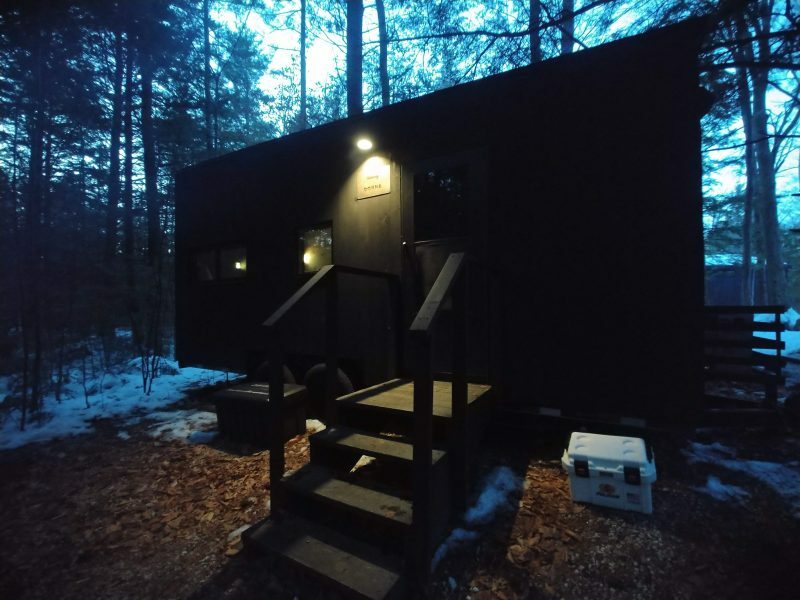 Aside from a faint cell signal, there is no connectivity here: no Wi-Fi or television in the cabins. A Bluetooth-enabled Tivoli radio allows you to tune in to a handful of local stations or stream music from your smartphone if you’re so inclined. A direct-line phone is provided in case you run out of s’mores or need to chat with the Getaway staff. For two days, we occupied our time by winding down and appreciating the fine art of doing … nothing. 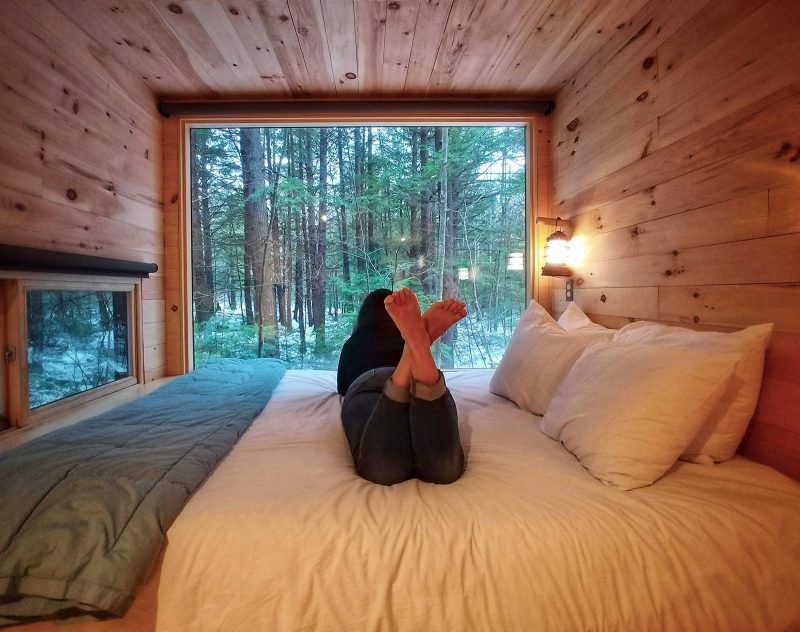 We read (a handful of nature, the outdoors, and living simply are provided), played Uno, cooked together, and spent a lot of time starting out that big, beautiful picture window. I wrote a Haiku. If you get stir-crazy, there are hiking trails and 20 acres of private grounds to explore. 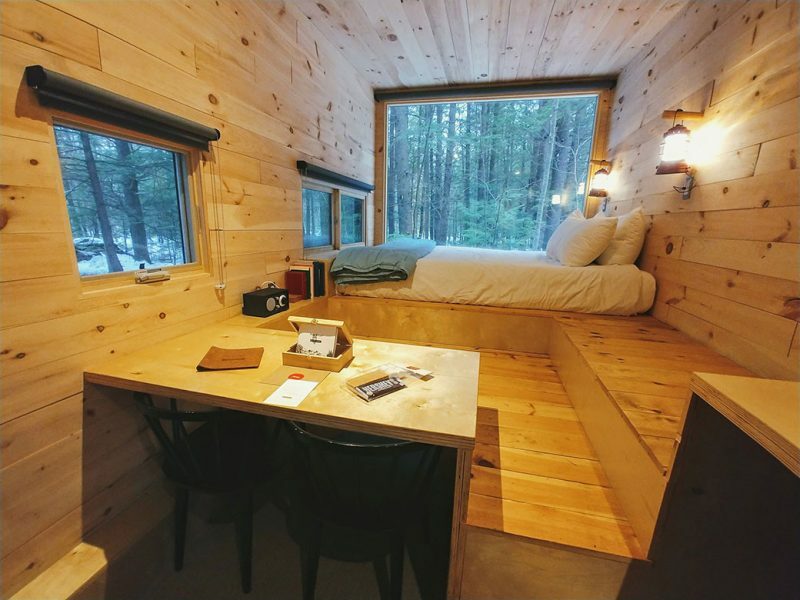 The cabins are positioned far enough away to provide the illusion of seclusion, but close enough to ensure you never get that creepy “alone in a cabin in the woods” feel. Our campfire spot was cleverly positioned to look into the woods, away from our neighbors. Inside, blackout curtains on most of the windows guarantee plenty of privacy. By shutting the right combination of shades, it was easy to feel like we were the only ones around for miles. 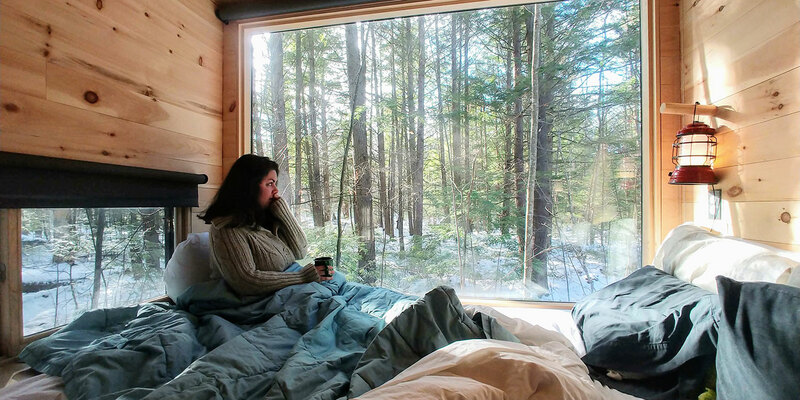 No matter what though, there was still that wide-open picture window to keep our view focused on the simplicity and beauty of the New Hampshire wilderness. It was a point of persistent calm that we never tired of in our two days at Getaway House. There was no wind, no rustling of leaves, no traffic, no city hustle. We couldn’t remember the last time we’d experienced such quiet and stillness. At first, it was almost disorienting. Ultimately, we found ourselves more relaxed than we’d felt in a long, long time. For (sub)urban dwellers seeking a blissful escape from the hustle of Boston city life, public transportation, and an always-on internet connection, Getaway House Boston is the near-perfect remedy. 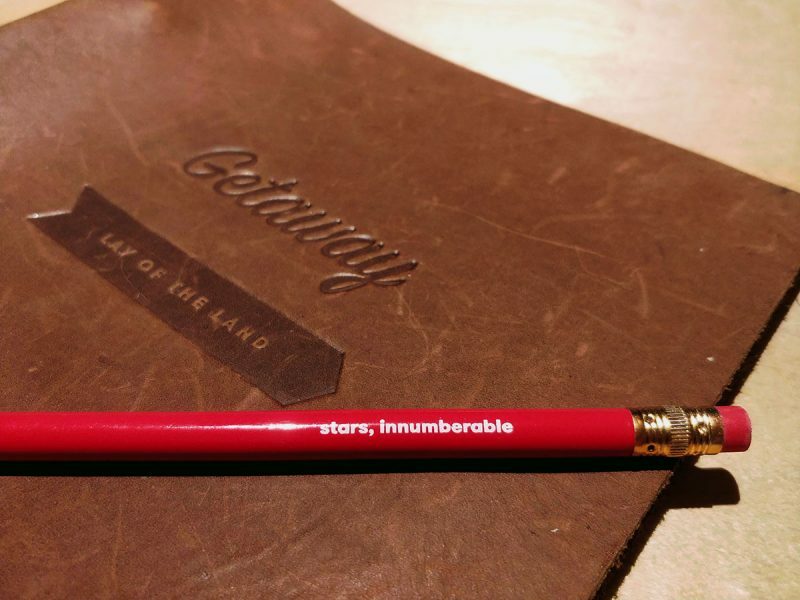 Getaway also has outposts near Atlanta, Los Angeles, New York City, and Washington D.C. — and we anticiplate plenty more in the near-future. Have you stayed at Getaway House Boston or any of Getaway House’s other locations? What was your experience?